Fusion is the epitome of “high risk, high reward” scientific research. If we were to ever successfully harness the forces that power the stars, mankind could have access to power that is almost literally too cheap to meter. However, as Visual Capitalist’s Nick Routley notes, reaching that goal will be a very expensive, long-term commitment – and it’s also very possible that we may never achieve a commercially viable method of fusion power generation. Today’s video, by the talented team at Kurzgesagt, explains how fusion works, what experiments are ongoing, and the pros and cons of pursuing fusion power generation. Fusion involves heating nuclei of atoms – usually isotopes of hydrogen – to temperatures in the millions of degrees. At extreme temperatures, atoms are stripped of their electrons and nuclei move so quickly that they overcome their “mutual repulsion”, joining together to form a heavier nucleus. This process gives off massive amounts of energy that investors and researchers hope will propel mankind into an era of cheap and abundant electricity, but without the downsides of many other forms of energy. Stars are so large that fusion occurs naturally in their cores – but here on Earth, we’re trying a number of complex methods in the hopes of replicating that process to achieve positive net energy. The International Thermonuclear Experimental Reactor (ITER), an experimental reactor currently being built in the south of France, will house the world’s largest ever tokamak – a doughnut-shaped reactor that uses a powerful magnetic field to confine plasma. Construction of the facility began in 2013 and is expected to cost €20 billion upon completion in 2021. Research organizations see ITER as a crucial step in realizing fusion. Though the facility is not designed to generate electricity, it would pave the way for functional reactors. There are some who claim that the bureaucracy of government-funded labs is hampering the process. 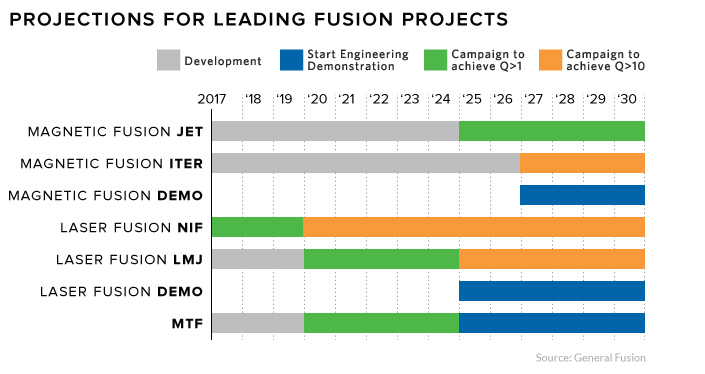 As a result, there is a pack of private companies, fueled by high-profile investors, looking to make commercially-viable fusion into a reality. Tri Alpha, a company in southern California, is hoping their method of spinning magnetized plasma inside a containment vessel will be a lower-cost method of power generation than ITER. In 2015, they held super-heated hydrogen plasma in a stable state for 5 milliseconds, which is a huge deal in the world of fusion research. The company has attracted over $500 million in investment in the past 20 years, and has the backing of Microsoft co-founder, Paul Allen. Helion Energy, located in Redmond, Washington, believes they are only a few years away from creating nuclear fusion that can be used as a source for electricity. Their reaction is created by colliding two plasma balls made of hydrogen atom cores at one million miles per hour. Helion Energy’s ongoing research is funded in part by the U.S. Department of Energy’s ARPA-E program, which the Trump administration slated for elimination. Thankfully, Helion still counts Peter Thiel’s Mithril Capital and Y Combinator as supporters. General Fusion, located in Burnaby, B.C., is taking a different approach. Their piston-based reactor is designed to create energy bursts lasting thousandths of seconds, rather than a sustained plasma reaction. Heat recovered bursts would be used to generate electricity much like nuclear power plants, minus the long-term radioactive waste. General Fusion has attracted millions of dollars in funding, including investment from Bezos Expeditions and the Business Development Bank of Canada. Though commercially viable fusion is still a long way off, each new technological breakthrough brings us one step closer. With such a massive payoff for success, research will likely only increase as we get closer to bottling a star here on Earth.